What is Feng Shui, you ask? Simply put, Feng Shui is the placement of objects in appropriate places to bring about luck. It can bring good or bad luck depending on the placement of the object. The laws of Feng Shui not only apply to things in real life, but also in Animal Crossing. Proper placement of furniture within your house can bring about good luck in finding money, items, or both. This guide will teach you all you need to know about applying Feng Shui to your home in Animal Crossing. 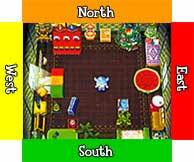 Feng Shui in Animal Crossing is very simple. You can think of it as color coding. Certain furniture and objects have Feng Shui colors associated with them. To learn which colors are associated with each furniture visit our items section. Some furniture and objects do not have any Feng Shui values and some have Special Feng Shui (which we cover later in this guide). Each Feng Shui color value has an area of the house in which it belongs. Putting the right colored object in the right area of your home can bring you good luck and putting that object in the wrong area can bring you bad luck. Use the diagrams to determine where each Feng Shui color value belongs in your home. As you know (or maybe don't know), your house will undergo 2 size expansions. Your house can also be seen as a grid. Some items take up one "grid" of your house. Some take up more. Each block in the diagram represents one grid in your house. You will notice that some blocks have 2 colors in them. This means that both of these Feng Shui colored items can be placed in this area of your house. Use the diagrams below to properly place your furniture in your house to get the best Feng Shui luck. Some furniture and objects have Special Feng Shui. These items can be placed anywhere in your house and will bring about good luck. Most of these items are rare and hard to find so keep your eyes peeled for these special items. Following is a list of items with Special Feng Shui. As you can see, Feng Shui is a pretty simple thing to learn. With the help of this guide and our items section you will soon be the luckiest resident in your town. Good luck!